Seasons Greetings to you! 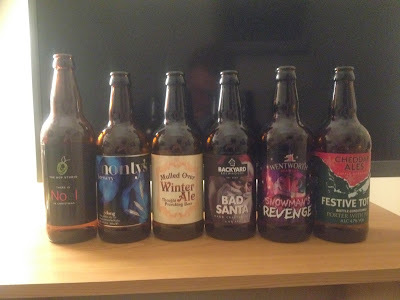 It is I, Lord of Tinsel Town to bring you Part Two of our Best of British Beer review! As Sam rightly said in his fabulous post on Tuesday, he couldn't be trusted with all 6 of the Christmas Grog provided so kindly by the Merry Elves at Best of British Beer. So it was up to be to slurp, slug and slump my way through the remainders..........! Tough job, but someone had to do it (just not Sam). I opened up proceedings with The Hop Studio's 'There is Noel in Christmas'. Brewed using a combination of Maris Otter, Crystal & Chocolate Malts we are greeted with a nose of hops, spice and Christmas cheer. A suprisingly light and quaffable beer that is perfect to get a night under way. Floral, fruity with underlying bitterness means this beer will be matched brilliantly with food such as cheese, curry and of course, Christmas Turkey. Secondly, there was Ding Dong from Monty's Brewery. A golden, dry ale designed for Christmas drinking. Despite this, I think this would work brilliantly as an all weather beer. Brewed with champagne yeast you really get a taste of that slightly bready, dry champagne style, topped with elegant floral and slightly tropical fruit. Really top quality, interesting beer that leaves the palate fresh and clean, and it comes in Magnums too! Now onto the serious stuff. Winter Ale from Mulled Over is a self described 'Thought Provoking Beer.' As an ex-Philosophy Student, this sounded right up my street. Dark in colour and flavour, you are getting rich nutmeg, cinnamon and all those lovely Christmas time flavours you expect from not only a quality, dark Christmas beer but also from your Xmas day pud. Although I didn't have Schopenhauer or Nietzsche running through my head, it did set my sights on December 25th. Now usually on Christmas Day, children all over the world think to themselves 'Have I been naughty or nice this year?' With this next beer, the roles are reversed, and we certainly know the answer to that answer when it comes to Big Santy. Bad Santa by Backyard Brewery is a beefy 6.8% bruiser packed with toffee, malt and liquorice balanced beautifully with deep dark fruit character. Beer with a good old St. Kick......... Boom. For a beer called 'Snowman's Revenge', this next beer from Wentworth's Brewery is surprisingly light and delicate. A good balance between malt character, whitbread hops and bitterness, this chestnut ale has a buttery taste with plenty of zesty sweet grapefruit and lemon kick. A lot going on, but on the whole, a balanced, refreshing seasonal ale. Last on the register was Festive Totty by Cheddar Ales. A dark porter enriched with ruby port delivers a smooth and rich beer with lip smacking sweetness. Packed with dark fruits and chocolate it is full and deep on the palate. For a lover of dark beers especially porter, this really was a treat and one I would highly recommend. My only qualm is that there is a lot of boozy, alcoholic aroma and flavour but it is only 4.7%. If you're going to make a porter with ruby port in, I want it to be a crotch-rummaging 6-8%. A really exciting mix of Christmas themed beers that have really gotten me in the mood for the Season of cheer. I highly recommend diving into the riches on offer at the Best of British Beer for your Yule Tide Yarg and by all means, send us some more. And next time, they're not for sharing!